It was in a little wood in early morning. The sun was climbing behind a steep cliff in the east, and its light was flooding nearer and nearer and then making pools among the trees. Suddenly, from a dark corner of purple brown stems and tawny moss, there shone out a great golden star. It was just a dandelion, and half withered – but it was full face to the sun, and had caught into its heart all the glory it could hold, and was shining so radiantly that the dew that lay on it still made a perfect aureole round its head. And it seemed to talk, standing there – to talk about the possibility of making the very best of these lives of ours. For if the Sun of Righteousness has risen upon our hearts, there is an ocean of grace and love and power lying all around us, an ocean to which all earthly light is but a drop, and it is ready to transfigure us, as the sunshine transfigured the dandelion, and on the same condition – that we stand full face to God. Gathered up, focussed lives, intent on one aim – Christ – these are the lives on which God can concentrate blessedness. It is “all for all” by a law as unvarying as any law that governs the material universe. We see the principle shadowed in the trend of science; the telephone and the wireless in the realm of sound, the use of radium and the ultra violet rays in the realm of light. All these work by gathering into focus currents and waves that, dispersed, cannot serve us. In every branch of learning and workmanship the tendency of these days is to specialize – to take up one point and follow it to the uttermost. And Satan knows well the power of concentration, if a soul is likely to get under the sway of the inspiration,”this one thing I do,” he will turn all his energies to bring in side-interests that will shatter the gathering intensity. And they lie all around, these interests. Never has it been so easy to live in half a dozen good harmless worlds at once – art, music, social science, games, motoring, the following of some profession, and so on. And between them we run the risk of drifting about, the “good” hiding the “best” even more effectually than it could be hidden by downright frivolity with its smothered heart-ache at its own emptiness. 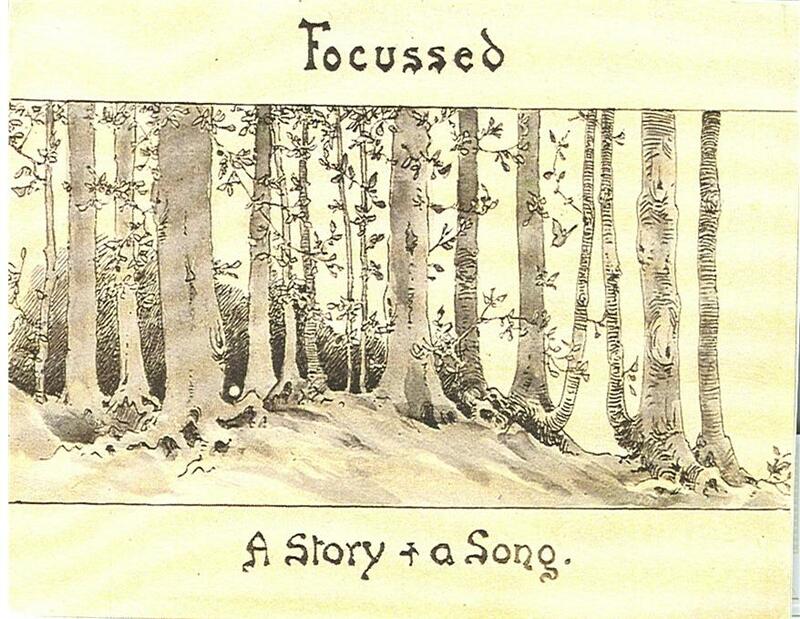 It is easy to find out whether our lives are focused, and if so, where the focus lies. Where do our thoughts settle when consciousness comes back in the morning? Where do they swing back when the pressure is off during the day? Does this test not give the clue? Then dare to have it out with God – and after all, that is the shortest way. Dare to lay bare your whole life and being before Him, and ask Him to show you whether or not all is focussed on Christ and His glory. Dare to face the fact that unfocussed good and useful as it may seem, it will prove to have failed of its purpose. What does this focussing mean? Study the matter and you will see that it means two things – gathering in all that can be gathered, and letting the rest drop. The working of any lens – microscope, telescope, camera – will show you this. The lens of your own eye, in the room where you are sitting, as clearly as any other. Look at the window bars, and the beyond is only a shadow; look through at the distance, and it is the bars that turn into ghosts. You have to choose which you will fix your gaze upon and let the other go. Are we ready for a cleavage to be wrought through the whole range of our lives, like the division long ago at the taking of Jericho, the division between things that could be passed through the fire of consecration into “the treasury of the Lord,” and the things that, unable to “bide the fire,” must be destroyed? All aims, all ambitions, all desires, all pursuits – shall we dare to drop them if they cannot be gathered sharply and clearly into the focus of “this one thing I do”? Will it not make life narrow, this focusing? In a sense, it will – just as the mountain path grows narrower, for it matters more and more, the higher we go, where we set our feet – but there is always, as it narrows, a wider and wider outlook and purer, clearer air. Narrow as Christ’s life was narrow, this is our aim; narrow as regards self-seeking, broad as the love of God to all around. Is there anything to fear in that? How do we bring things to a focus in the world of optics? Not by looking at the things to be dropped, but by looking at the one point that is to be brought out. Turn full your soul’s vision to Jesus, and look and look at Him, and a strange dimness will come over all that is apart from Him, and the Divine “attrait” by which God’s saints are made, even in this 20th century, will lay hold of you. For “He is worthy” to have all there is to be had in the heart that He has died to win. And each a face he fain would ever see? All, O Beloved, in Thee. 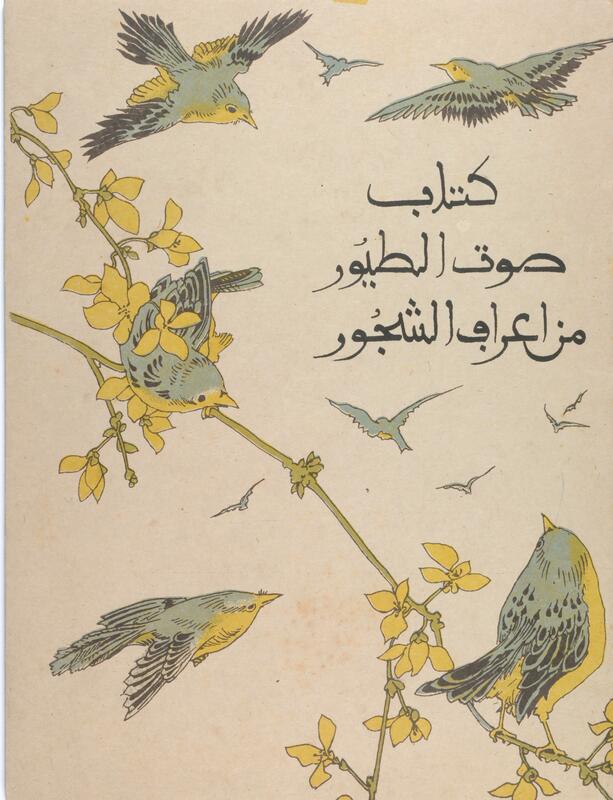 The Book of the Voice of the Bird among the Flowers. We love the birds because God loves them. He teaches them and we must listen to their story. and soar above the trees. and go up to heaven. but you need our Master Jesus to lift you to heaven. But there are children who are afraid at night. even though there is nothing to make them afraid. This eagle is hovering over the chicks. but Jesus Christ wants to guard us from him. flee to Jesus and He will protect you from him. Do these birds search for anything? And what is the food of children? barley, bread, etc. to be food for us. Do you see the nests in the tree? How the nest is made? And love makes her forget her tiredness. These are the eggs which she lies on. when the particular lesson is lengthy for you. cries alot, but love makes work light. Ask love from God, and patience will come with it. 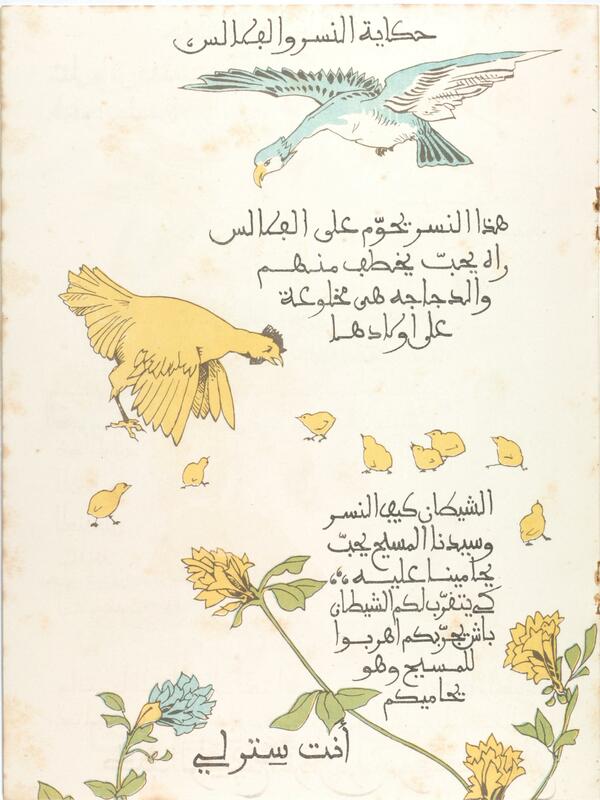 Why do birds sing (warble)? sing when their hearts are happy. their voices rise up before God with the voices of angels. When the bird wants to sleep he puts his head under his wings. even though there is nothing to make them afriad. birds – and even more. Delighted to learn of your interest in Lilias. I would be happy to meet with you during your Florida visit and help in any way that I can. You are welcome to view materials I have gathered – most likely, first sources, you have seen in Loughborough. Alasdair called to my attention that my posting of The Bird Book had some duplications and several other inaccuracies. 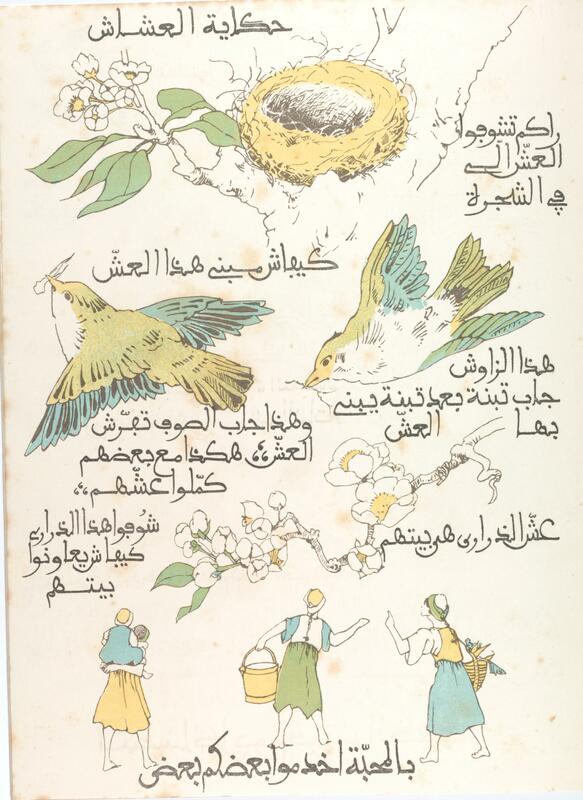 I must have posted that in haste (and will correct in time) but the original (Arabic) is in Loughborough – but without translation (which was done for me by an Arab speaking friend). Yes, let’s keep the conversation going! Thanks for your reply. Yes, I see now what Alasdair means; I was so excited to see the post that I didn’t look carefully. 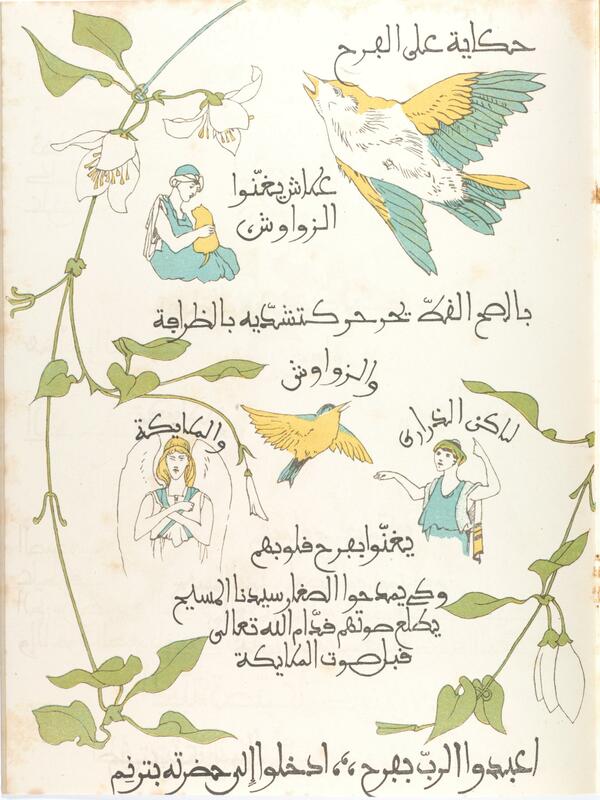 Part of my thesis will look at language issues of the workers in NA, and thus, for Lilias and any others, I want to examine their use of Arabic – which versions, i.e. Classical vs. vernacular. I see that the above texts are mixtures of dialect and classical. 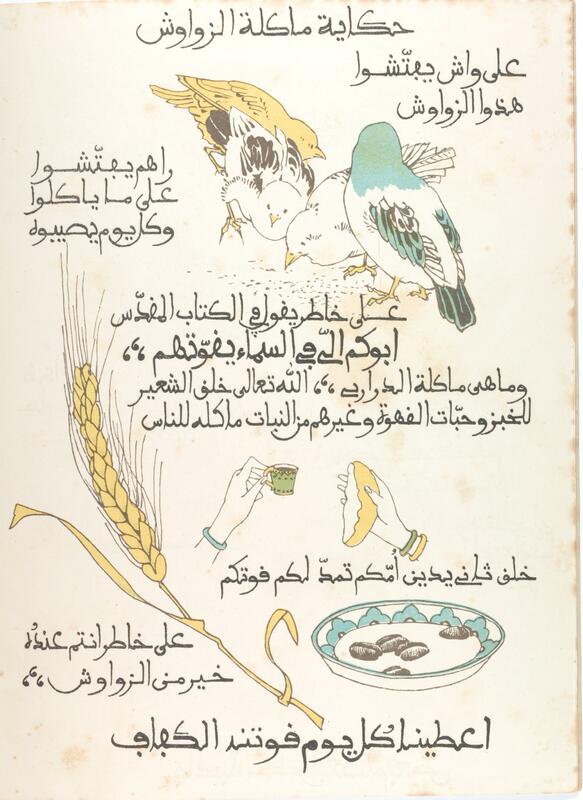 As you may know from any of the AMB/NAM primary sources, letters and journals, conversations with friends are narrated in a way that loses the flavor of the original, and very little is to be found in Arabic 🙂 But since Lilias published so much in the way of tracts and brochures she is a different case than other workers. And I know her goal was to reach her people through their heart language (I just have to prove it with evidence!). Maybe you have already written something about Lilias that speaks to this issue? Peace. Yes, indeed. That was a real concern of Lilias. Have you read I, Lilias Trotter, Blanche Pigott’s compilation (and annotation) of Lilias’s Journals/Diaries/Letters? She devotes 2 segments of the book to this subject: 1X. Tract-writing and Translating 1902-1904; X11.Translating – Sweden 1908, 1909, 1910. 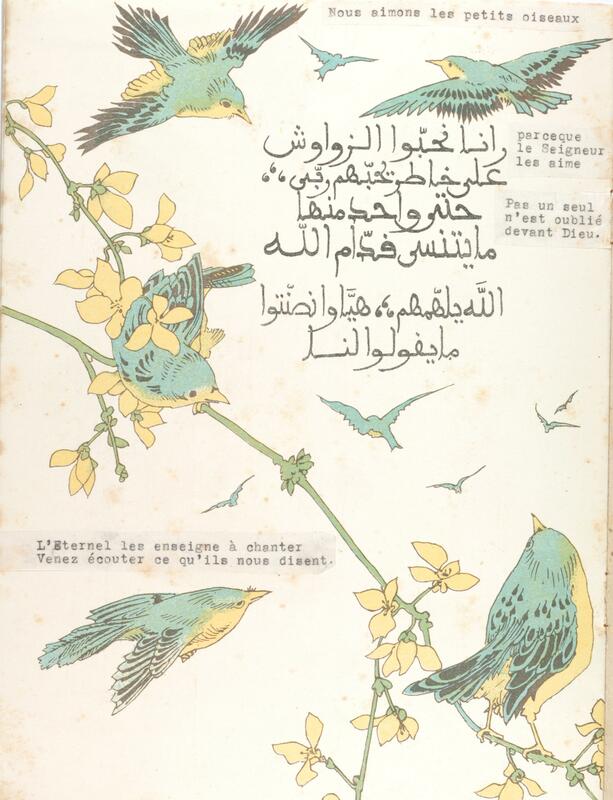 They dealt with both the limitation of the classical Arabic translations of Scripture and their subsequent “revisions,” as well as their (Algiers Mission Band workers led by ILT), efforts to create a literature with the characters, stories (parables), and asthetic sensibility of the nationals. 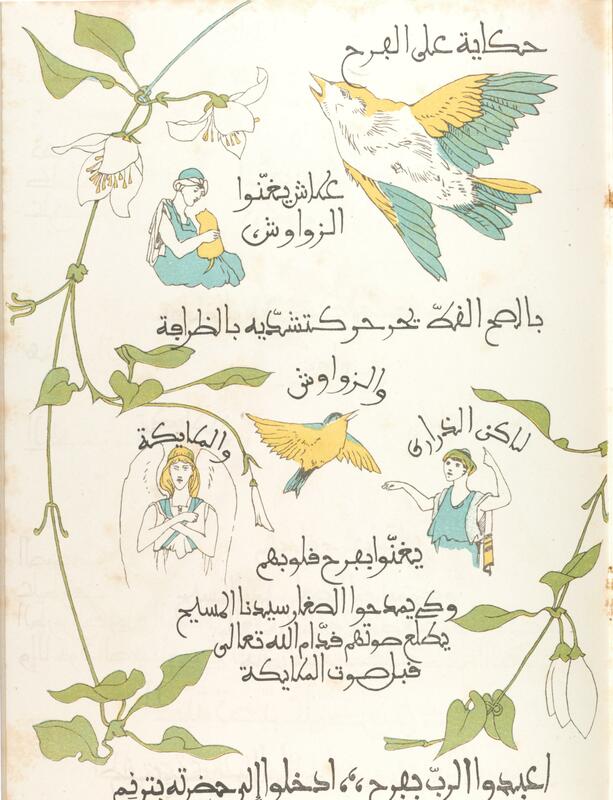 This was done with great creativity – some with a 2-color illustrations, a French text, and a blank space for the colloquial translation. (Perhaps you saw some of them in Loughborough?) They were tireless and inspired in this endeavor. The challenge of deciphering the important earliest “eye-witness” source (Pigott’s book) is that many place-names and proper-names are indicated by initials – for the obvious reasons at that time. I attempted, in brief, to make sense of this effort in Passion for the Impossible – filling in the blanks and expanding (at times) from other sources (namely her diaries and journals). (At best, mine was a limited treatment of the subject.) There is plenty of “evidence” of your thesis in those sources. That would be a wonderful study in itself! 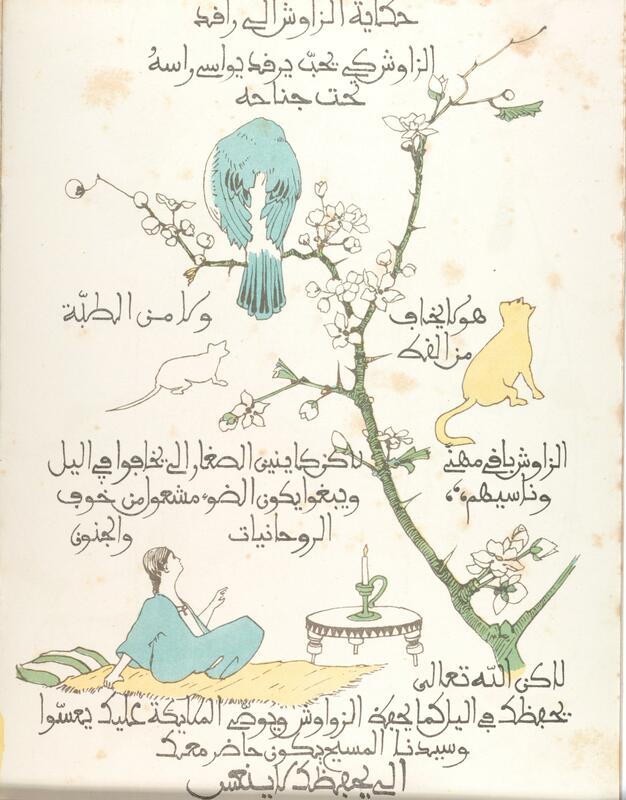 Her last effort, while confined to bed, was to translate the Sevenfold Secret for the Sufi Mystics into their particular dialect with all the shading and nuances unique to their regional dialect. Toward that end, she had two young men (“sons of sunshine”) at her bedside working with her in translating. Have you seen the Arabic version of The Sevenfold Secret? These are my limited off-the-cuff responses to your important questions – for what they are worth! Blessings. . . This is a great answer, thank you! I found the Sevenfold Secret in Arabic online — Concerning the Sevenfold Secret, are you saying that she translated it into more than one Arabic dialect? 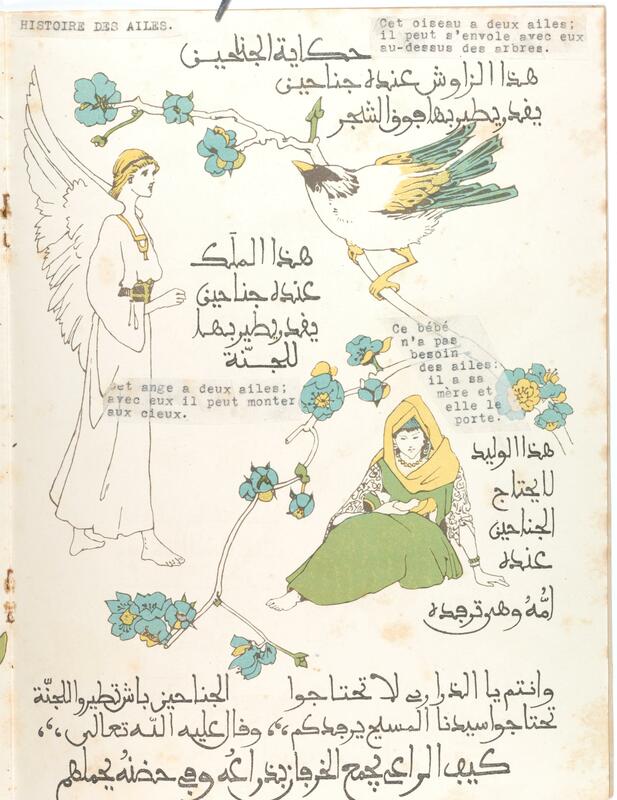 I’m trying to track down Blanche Pigott’s work, which is a bit trickier, but I know it’s in some libraries. Hers is about the only biography that I did not read 😦 Passion for the Impossible is the best for me because as you say you filled in the blanks making my life easier 🙂 Blessings….